The intention of this 'How-To' is to cover/bring together the common aspects of removing, replacing or swapping the FD body OEM headunit for another or an after market unit. Sections of this information is either buried as sub-posts to related topics (I hope the authors won't mind me 'stealing' instructions) or found by googling. It won't really cover handling specific aftermarket units and/or 'extra' functions of OEM regional head-units. However the pin-out referenced is from an OEM headunit (FD-01) fitted in AU (it is what is available) - the pin-functions shown should apply in *most* instances being generic/mandatory functions... but different OEM pinouts, plus extra connectors, might apply in your region i.e. there is a chance pins could have different functions. But more likely the pins for functions not used in your region (if any) will be 'N/C' for you, with 'extra functions' on pins shown as 'N/C' or in extra connectors (if present). An example is: In some regions there are 'Navi' headunits - with an extra connector for that plus an extra aerial socket (for either it or digital/satellite radio). * Center console fascia - may, or may, not have a storage compartment on top. This affects method of fascia removal. * 'Manual' or 'Automatic' controls for A/C - this affects type of fascia (if replacing) and how those controls are connected. 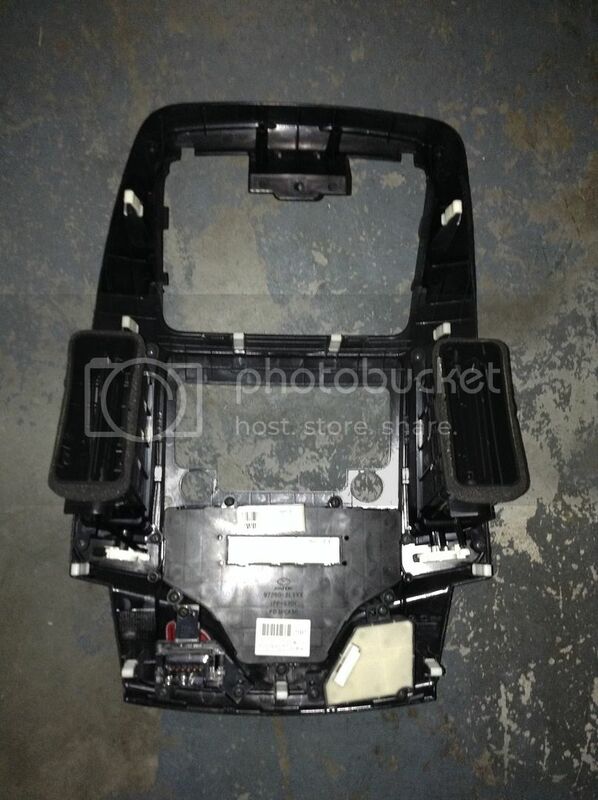 * Center console fascia appears to come in LHD/RHD versions - recommended: check if ordering a replacement. * Some OEM headunit models have extra connectors for extra functionality - e.g. 'Navi' units. * You probably will need an antenna adapter - Hyundai used a 'square' connector in the FD bodies, most headunits use the traditional 'round' antenna socket. * Only if present - remove the storage compartment by unscrewing the four screws holding it and pulling up/forward (to clear a lip and the hinges - which fit in gaps in dash). Then undo the one screw hidden by it that secures the fascia. * If you have a blanking plate there instead do not try to lever it out (secured from underneath) and there is no screw for the fascia. * Start pulling the fascia out (plastic spring clips mostly) - if you have a storage compartment you can start there (or use one of the following methods). ** Otherwise you will need to start at the bottom edge - which there is two ways: Remove the storage (and cigarette tray) unit under it (unscrew at back of storage and unplug); or lever using something non-sharp thin/flat (see photo for tab locations) until you can use your fingers to pull it. In both instances you probably want to be mindful of those tabs/slots at the bottom. Both of these methods shown in the videos. * Once the fascia is removed you should see four metal tabs, above and below pointing out, from the radio - which are screwed to the dash frame. * Undo the screws and the radio should be able to be pulled/wiggled out - there is a sprung friction clip on the bottom of the radio. * Unclip and/or unplug the multiple connectors and remove the headunit. * If applicable: secure the fascia with it's screw and re-fit/secure storage compartment(s) with it's screws. While the hole/slot in the dash frame is '2DIN' size - the face of the OEM (2DIN) unit pokes through various holes (for it) in the fascia, effectively making the headunit face integrated into the fascia. So the hole in the fascia isn't a 2DIN space. * Fit a 2DIN 'adapter' surround to OEM fascia - basically: cut away parts of your OEM fascia and the adapter covers the cut edge and may provides ledges into the dash (to take account of curved fascia surface and usually vertical faces of headunits). See this post from Abis for some info and images. * There are two types of fascia regarding A/C controls - Manual or Automatic (also marketed as climate control) - you will need the right one. 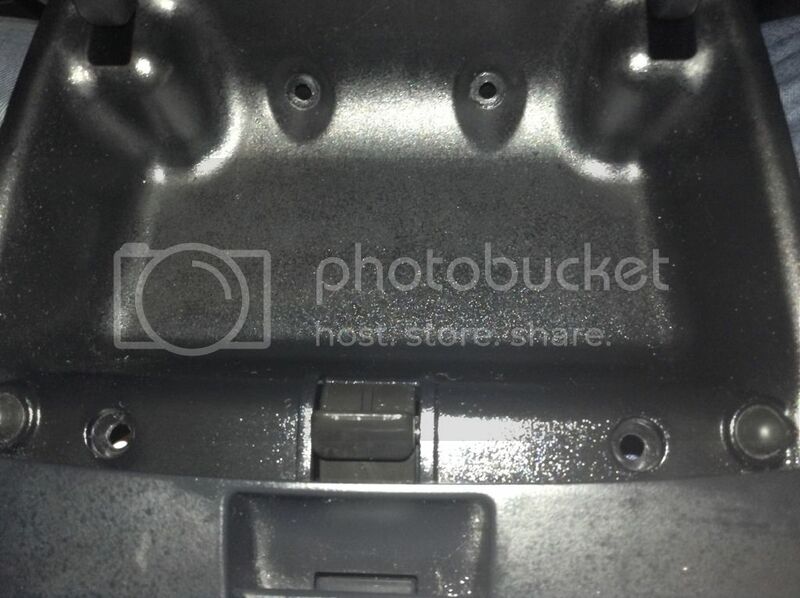 * Center console fascia appears to come in LHD/RHD versions - it is recommended to check if ordering a replacement. * And they may, or may not, have the storage compartment on top - likely replacement fascias will not. Aftermarket headunit mounting could vary depending on the headunit - different versions of the 2DIN 'adapters', and/or replacement fascias, appear to come with varying extra pieces. 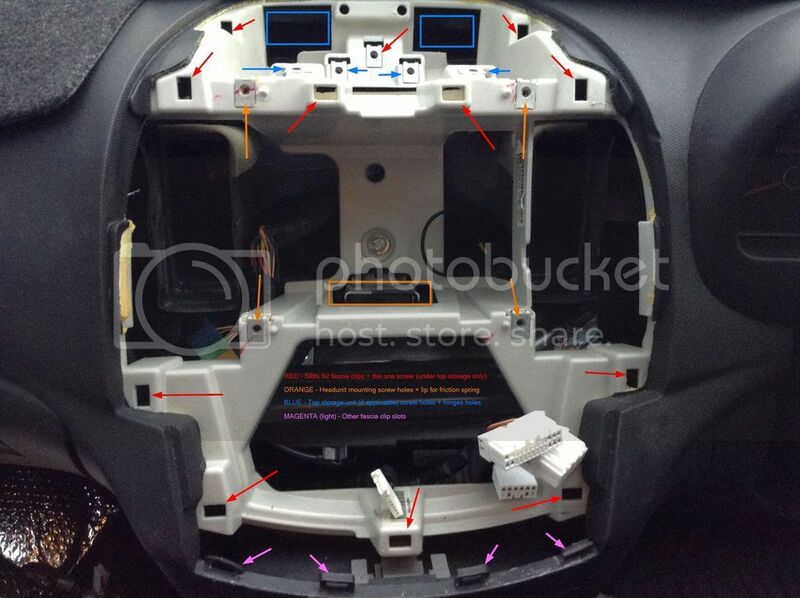 You might need a separate 2DIN generic mounting enclosure - securing that to the dash framework and the headunit to it, as done in the above mentioned post from Abis. All the OEM headunits for the FD body appear, at a minimum, to use ISO 10487 connectors - however the std. only applies to the *physical attributes*, pin function can be headunit manufacture defined. As there is no standard for pin function, for any of the pins in ISO 10487 connectors, the manufacturer may define them as they see fit - so when fitting an aftermarket unit, especially, the user will need to check pin-function mapping and almost certainly do some re-wiring (or get/make an adapter cable). There seems to be a general convention for some of the 'essential pin' functions (power and speakers) - but it isn't mandatory. Note for aftermarket headunits: you probably will need an antenna adapter - mentioned earlier. You may also want a wiring loom 'adapter' - which can cover a couple of different situations... not needing to remove/reinsert (which could be hard) pins for swapped pins in the vehicle connector (or cut and splice the wires to achieve the same) to match the headunit (where it uses ISO 10487 connectors); or not needing to cut the plugs from the vehicle wiring (if it doesn't use the connectors). If doing this you will probably want (unless your lucky enough to find a suitable pre-wired one) an adapter loom that connects to the vehicle plugs on one end - so you can connect the wires from it to the wires from whatever wiring loom the headunit is supplied with. Just be aware some adapter looms don't come with all connectors present. A common 'gotcha' is the swapping of the '+12V Ignition' (on/off) and 'Batt (+)' (memory/power) pin functions. If not checked, and swapped if required, it can cause issues like the headunit not having any memory - a number of people installing aftermarket units have hit this. Also aftermarket units might not make use of some pins/functions (or might have different connectors for them e.g. AUX IN might be RCA sockets or a TRRS connector) used by the OEM units ('Speed' for example) requiring them to be rewired or disconnected, and may offer functions not supported by vehicle wiring (e.g. reverse camera - which would require extra wiring in most FD bodies). Another point to note is 'Ill+' and 'Ill-' (Illumination) on OEM units - if the aftermarket unit only has one 'Ill' input then simply connecting 'Ill+' to it (and grounding 'Ill-') might not have the desired effect... 'Ill-' might be part of the control circuit (or it might just be to keep from having multiple earths). 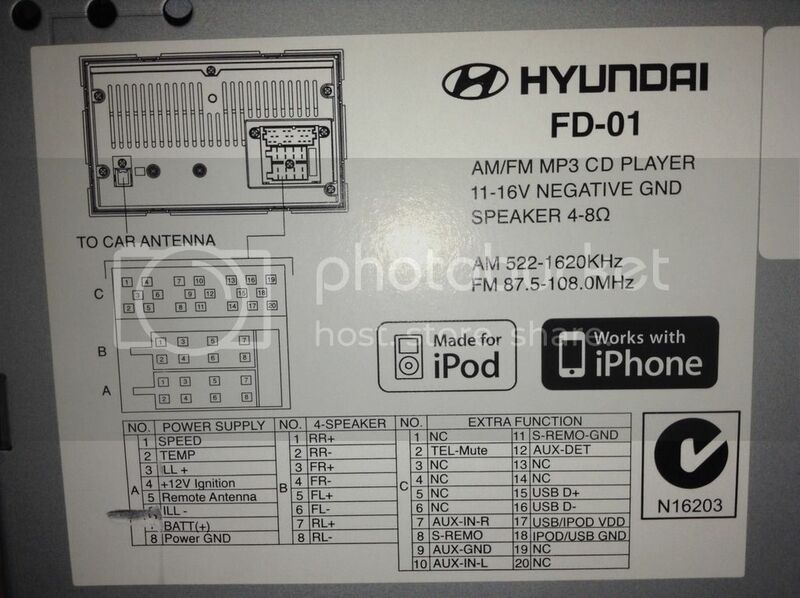 However, in regards to OEM headunits, it would seem (though not ignoring the prior warnings about there might be different pinouts and/or the PA-760 units) that Hyundai tries to keep the general pin function consistent for the OEM units for a vehicle model (if not between vehicle models). Pins used for a regional function, or an option, doesn't seem to get reused elsewhere unless it is similar purpose. Some 'extra' functions have extra (non ISO 10487 defined) connectors - e.g. 'Navi' (and similar) units. Which is why OEM units can be largely 'drop-in' replaced in regards to basic functions - but a 'Navi' unit might not work in a non-Navi vehicle. Which brings us to vehicles with a PA-760 - it appears these units run an external amp, and it has been reported they can't be swapped for other OEM units (e.g. PA-710 or FD-01). If use of the amp is mandatory with a PA-760 - then it is likely the PA-760 uses 'line-level' (high impedance) outputs to the amp (probably on the same pins as the speaker outputs) unless it uses something like digital audio encoding to the amp (which it might being OEM unit to OEM amp). What it boils down to is either: a) needing a headunit that will supply the needed audio output (likely 'line-level') to drive the amp and taking into account the connectors; b) removing/bypassing the amp (leaving some very long wiring runs between headunit and speaker); or c) replacing the amp. Can I ask you where you got the Fascia (with the top cubby gap)? 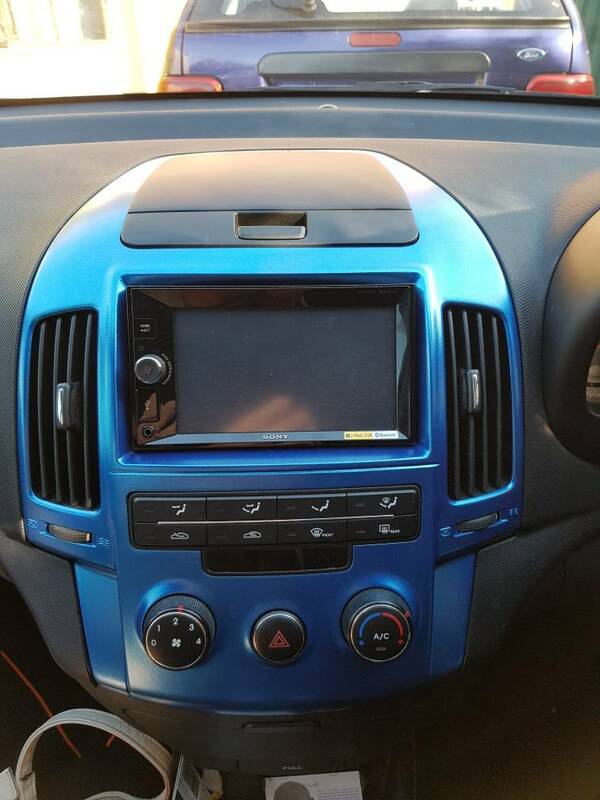 I am trying to put a 2DIN unit/tablet in my car dash replacing the OEM radio (2011 Hyundai Elantra Touring GLS), but the 2-DIN Fascia that I am seeing do not have the cubby hole. Fascia with cubby, looks real nice quality but very expensive. This seller has a "make an offer" if you'd like to barter. Fascia without, found comments about poor fit and poor colour match. Anybody got links for any others for FD auto air versions? Nice. I especially like seeing the pin-out diagram without having to pull mine out. I wonder: without changing my unit, would I be able to use any of the outputs to connect to a headphone jack?